Uglyworld #308 - Jeero Making Fun Of Cinko (26/365), originally uploaded by www.bazpics.com. As you know Jeero isn''t the smartest ugly on the block (rumour is it he preferred standing in the pudding queue to the one involved with handing out brains), but he tries to cover this up by making fun of the youngster of the group, Cinko. I never let the fun go too far as it wouldn't be fair on Cinko, but just between you and me - Cinko knows what's going on and just plays along with it most of the time to make Jeero feel better. 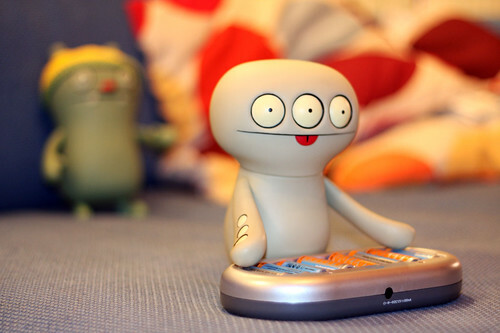 In this case Cinko wanted to play the Xbox360 and Jeero handed him the battery charger and told him it was a new state of the art controller. LOLz! I am so happy I found your blog. Please, post every day, your pictures are amaizing and I love your little guys!